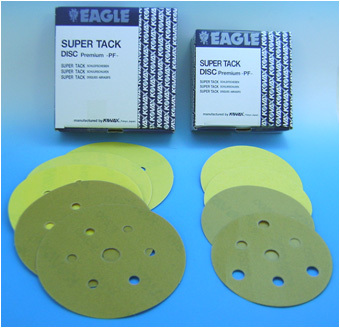 Premium SUPER TACK -PF- Disc Kovax Premium Super-Tack -PF- Discs utilize special flexible bonding technology that will effectively reduce scratches and increase cutting power.These high performance velour-backed discs with tough backing paper last long and produce superb finishes that will satisfy the most demanding requirements. 8"(203mm dia.) P-1 (with holes) P150, P180, P220, P280, P320, P400, P500 & P600 786- S/A, D/A Sander etc.